Posted by rik94566 in Controlled Environment Agriculture, DIY aquaponics, Electronic Componets, indoor aquaponics, IoT aquaponics, Temperature Probe. I say this because I will be displaying my aquaponic – IoT – Balcony Unit at Maker Faire next week in San Mateo. To accomplish the IoT part of the build I have to use technology that allows for internet communication thus IoT! Well there are many options available to accomplish this task – some not so easy and others not enough features to be effective for this project. I made this choice because I had one (but had not used it as yet) and the fact that documentation on it is easy to find. The other fact is that Temboo www.temboo.com uses the YUN as one of its options for their solution to the Internet of Things and I am working with them on this open source project so many others will be able to get up and running in short order and have simpler options to add additional capability based on the persons needs and I will not have to supply the customer support for any aspect of the code other than give everyone a stating point. WELL – that is where things got interesting. Now I had to research out why it was not listed as a port option in my Arduino IDE. Well after some time and deep research I found that Arduino IDE only works some times for the YUN on wireless. So the uploading from Arudino IDE to the board is not an option as most of the YouTube videos demonstrate quite well. This becomes an issue because I found out that as configured the YUN does not have enough on board memory, so a SD card is needed. Using an SD card with the YUN requires that the card be format using the YUN. To do that you need to know that the YUN is connected to the internet and working properly which is very hard to know if it is or not. 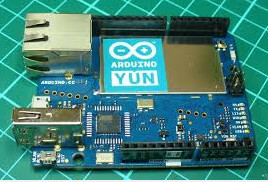 So once you know the YUN is connected and you have it connected through cable to your computer you need a file called ” YunDiskSpaceExpander” found on the Arduino site. Once uploaded you access it through the Serial Monitor of the Arduino IDE. If all goes well you answer a bunch of cryptic questions and bingo the thing kicks off. Once do you have a formated YUN SD enabled board. Now I am ready for the real fun stuff to generate code to be used through Temboo so I will have “Streaming Data” and text messaging in short order – lets hope! The good news in all of this is that I will be documenting all of this for the instructions to the Balcony unit for all to use and save anyone interested in building one or gets a kit from me that will be up and running in short order. See you all at Maker Faire next Saturday if you make it there!